Last week in this blog you read about the tree we planted a couple of years ago by Davey’s spot in the cemetery. I mentioned that it was crooked – blown around by the fierce winds out on the edge of the city. This week I received a call from the Phoenix Police Department asking me if they could straighten the tree. Officer Paul Rutherford was buried right next to Davey so the tree was going to be in the center of his ceremony at the cemetery. And the Phoenix PD wanted everything to look great so they wanted to straighten out the tree. Of course they did! That’s what they do, isn’t it? They straighten out accidents on our freeways. They straighten out situations in our neighborhoods. They help people straighten out their lives. They are experts at straightening out things. So, of course, I said yes to letting them straighten Davey’s tree. In this picture, Davey’s tree is standing tall and strong in front of Officer Rutherford’s squad as they say their final goodbyes to their brother in blue. It’s almost like Davey is standing there, honoring his brother as well. As usual, he’s right in the middle of what’s going on. I don’t think that’s a coincidence. This part of the cemetery is starting to feel like hallowed ground. There are several fallen officers buried in this same area. 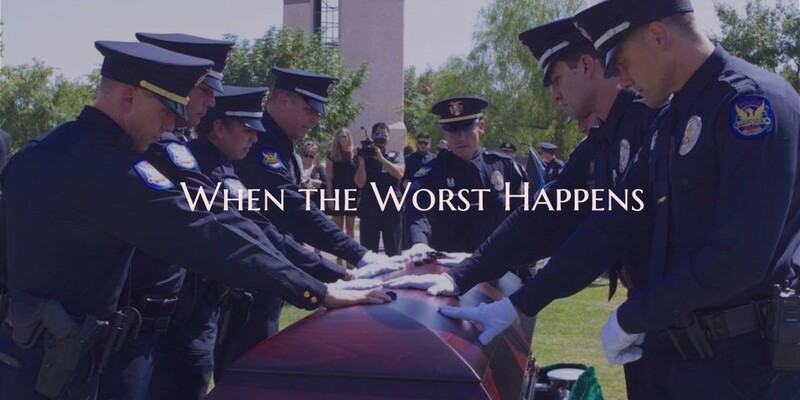 They remind us of the high level sacrifice demanded from Law Enforcement officers. They remind us of the huge amount of courage it takes to wear the uniform of one of the ‘good guys’ in a culture that no longer respects ‘good guys’. They remind us to show our love and support for all law enforcement officers as often as we get a chance.